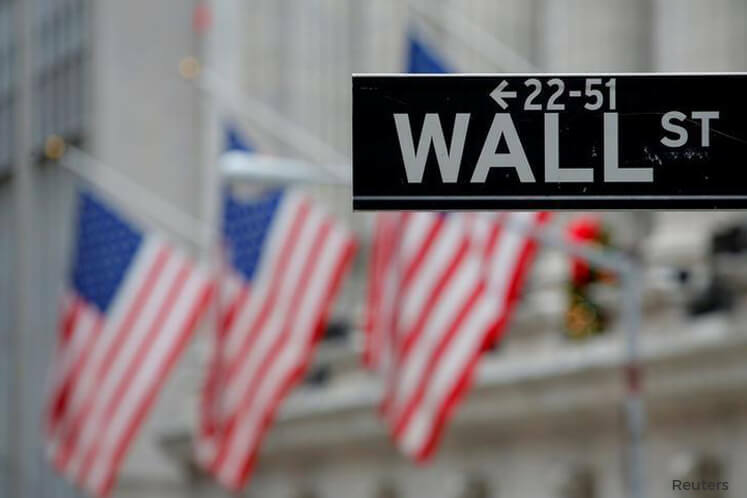 NEW YORK (April 10): US stocks were slightly higher on Monday as oil prices rose and as investors prepared for big banks to kick off the first-quarter earnings season later in the week. JPMorgan, Citigroup and Wells Fargo are scheduled to report quarterly earnings on Thursday and could throw light on the US banking industry's performance amid a rally in financial shares since the election of President Donald Trump. Investors are keenly watching the quarterly earnings to justify lofty market valuations following the post-election rally, sparked off by bets that Trump would introduce pro-growth policies. Earnings of S&P 500 companies are estimated to have risen 10.1 percent in the first three months of the year, the most since the fourth-quarter of 2014. The index is currently trading at 17.4 times forward earnings estimates, above its long-term average of 15, according to Thomson Reuters I/B/E/S. "It looks like the start of a quiet holiday week after an underwhelming Friday, where much could have happened but didn't," said Andre Bakhos, managing director at Janlyn Capital in Bernardsville, New Jersey. "Unless there is a significant headline to derail what looks to be a quiet morning, I think the focus is going to be on earnings and what the companies say." Thursday will be the last trading day of the week on Wall Street ahead of the Good Friday holiday. At 9.36am ET (1336 GMT), the Dow Jones Industrial Average was up 32.18 points, or 0.16 percent, at 20,688.28, the S&P 500 was up 4.49 points, or 0.19 percent, at 2,360.03 and the Nasdaq Composite was up 13.32 points, or 0.23 percent, at 5,891.13. Eight of the 11 major S&P sectors were higher, led by a 0.43 percent gain in energy following a more than one percent rise in oil prices. A raft of deals also lifted sentiment. Shares of Straight Path Communications surged more than two-fold to US$91.75 after AT&T offered a huge premium for the owner of wireless spectrum licenses. The deal also lifted shares of other communications companies. Swift Transportation jumped 23.4 percent to US$24.70 after it announced a merger with fellow trucking company Knight Transportation. Knight's shares were up 15 percent at US$35.20. Generic drugmaker Akorn was up 10.4 percent at US$32.86 after confirming that it was in talks to be bought by German healthcare group Fresenius. Amazon.com was the top stock on the S&P and the Nasdaq following a "buy" upgrade by Needham, according to a trader. Advancing issues outnumbered decliners on the NYSE by 1,574 to 903. On the Nasdaq, 1,270 issues rose and 930 fell. The S&P 500 index showed three 52-week highs and two lows, while the Nasdaq recorded 18 highs and 10 lows.